No picture available - as yet. No picture available - as yet. I added a snippet beneath in blue. October 3, 2009. Anne JACKSON married M. JOHNSTON*. Margaret JACKSON married Unnamed WORTHINGTON. Jane JACKSON married Unnamed GROGART aka GROSZETT. Elizabeth JACKSON married a (George or Thomas) SHEA. Alice JACKSON married an unnamed LOY (aka LOYE aka LOW aka LOWE). David JACKSON (aft 1755-1796), married Margaret BRADFORD (abt1739-1820)*. NOTE: I have suspicions about the accuracy of Margaret BRADFORD's birth date - and I don't know the source of it. If it were true, it would mean that she was considerably older than her husband and also in her 40s when her children were born. Sarah JACKSON,(1774-1828). Married Phil GRIFFIN*. NOTE: The birth date comes from a news article that likely refers to another Sarah JACKSON. This Sarah JACKSON (1774-1828) is unlikely to fit here since her birth date would have been 31 years after her mother's marriage. For lack of anywhere else to connect the Sarah JACKSON who has this birth & death date, I am leaving this be - temporarily. It may be that she was a late life addition or that she was adopted. : SOURCE: Newry Commercial Telegraph: Issue dated 3 March 1828. Died. On Friday the 29th ult. aged 54, SARAH, wife to Mr. P. Griffin of this town, after a long and painful illness which she bore with that patience and resignation ever characteristic of a pure conscience. She was an affectionate wife, a kind and indulgent mother, and is sincerely regretted by all who knew her worth. Transcribed by Alison Causten. * The names “BRADFORD” and GILMORE (also spelled GILLMER or GILMER) will occur frequently at various stages of the family tree. GRIFFIN reappears at least once more. JOHNSTON is also the name of a a prominant landed family which appears with connections which we can follow in the BIRCH line. 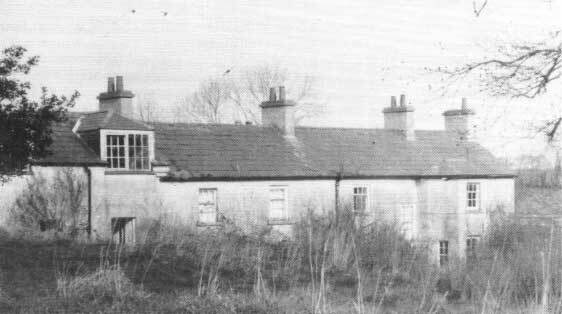 Undated photo of Urker Lodge - 1990 Journal of Creggan Local History Society & in the family collection. I don't know when the first part of the house was built, but include it at the start of the JACKSON story as something of an anchor. The first known inhabitant of Urker (or Urcher) Lodge at Urker, Crossmaglen was George JACKSON. From the family tree done by Gika JACKSON (based on the original work done by Eileen Oliver BARTLEY), we have been told the following: The ancestor of this family came from Co. York in Cromwell's army and was granted lands in Co. Carlow for his services. This estate called Mount Leinster was sold in 1745 by his descendant, George Jackson who settled at Urker, Crossmaglen, Co. Armagh. Further received family history (SOURCE: Blin BROWN) said that George JACKSON was "master of the Charter School (Lisgolat House + 1/3 story)". 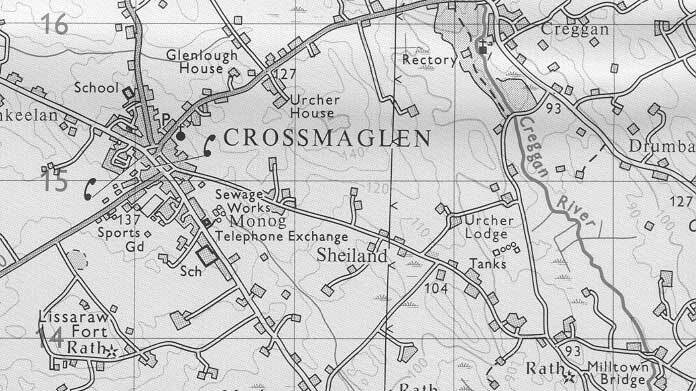 After countless fruitless searches for a townland called "Lisgolat", I finally figured out that the townland called “Liscalgat”- a townland of 220 acres to the SE and adjacent to Urcher.– was in all likelihood, the same place. This was probably the first place in the area that the JACKSONs settled in as the 1766 Census of Creggan lists a George JACKSON as a Protestant resident at "Lisgallot, Co. Armagh", but not at Urker (at least for that year). The first evidence of the JACKSON's residency at Urker shows up in the 1828 Tithe Composition Book, Creggan Parish where it is Elizabeth JACKSON (nee McCULLAGH and widow of George & Margaret’s grandson, John) who is shown as the owner of 30 acres in Urker and of 50 acres in Liscalgot. The Charter School at Liscalgot opened in 1737 (SOURCE: A Brief Review of the Rise and Progress of the Incorporated Society in Dublin). If George JACKSON started as a schoolmaster at this time (and this seems likely - based on family lore), then he would have been 19 years old. George JACKSON first shows up in the Creggan Vestry records in 1742, and later in the 1766 census and then in 1828, we see the family names of Samuel GILMER, E. JACKSON and Thomas. Peter, Pat and Manus LOY - quite possibly descended from the unnamed LOY who married Alice, a daughter of George JACKSON and Margaret O'LAUGHLIN. These names continue in future records. Another document from Blin BROWN which I received via Wendy JACK (in Australia), shed more light on the question why George JACKSON might have choosen to relocate from Mount Leinster. According to the history that Blin directly received from her grandfather (David JACKSON of Urker – and great-grandson of this first George JACKSON), “The estate was entailed.” Seemingly, the Leinster land had to be sold to settle liens against it. Further details on this story came from Major WRIGHT of Gilford Castle and a g-g-grand-nephew of Sir Thomas JACKSON. According to him, George JACKSON came to Creggan as a schoolmaster and taught at the newly opened Charter School which opened 13 September, 1737. (Source: Mary Cumiskey, "Sir Thomas Jackson" 1990 Journal of The Local Creggan History Society). Frank HH King seems to agree with this version. In his book on the history of the Hongkong Shanghai Bank, he states: “His father (Sir Thomas’s father), four generations from a landholder who around 1750 had lost all, was a teacher in the local school; his mother was an educated woman of Huguenot ancestry”. The story of the JACKSON family origins in Leinster is corroborated by other sources including “Burkes Peerage” in its entry under “Jackson of Stansted” - although it is just as likely that their account is based on the same verbal family lore as ours. With respect to the ancestors of Margaret O’LAUGHLIN, all that we know from Gika JACKSON's work is that she was “descended from the Royal House of Tara". I am still learning what this might mean. Curiously, a recent book on DNA, "The Seven Daughters of Eve" by Bryan Sykes gives the name "Tara" to the genetic "mother" of the 9% of native Europeans living in the Mediterranean and the western edge of Europe as well as in parts of Britain and Ireland. Who knows. One little snippet from the Creggan Vestry records mentions her in the year following her marriage: 1744 "Mrs JACKSON to be payed for working ye surpus & the linen for the communion table and keeping ye vessels clean". Given the earlier goosechase with the spelling of "Lisgolat", when it comes down to chasing the origins of names, I am learning to be a little looser in the saddle. Over time, particularly in times that were largely pre-literate, names went through a number of transformations before they ended up looking anything like the versions of the names that we see in print today. And after all, Mark Twain once said that a person who can not spell a word more than one way has no imagination. With that in mind, and using my imagination, various spellings suggest themselves. O'Loghlan, O Laghlan, O Loughlan, O Loughlin, O Loghlen, Loghlin, Loughlan, Loughlen, Loughlin, Laughlin. It may be that the name originates from the Gaelic "lochlannach" meaning a foreigner (especially a Viking - if so, would this be the source of the gene that so often contributed the aspect of tallness to our make-up?). Apparently, this surname originated in the 10th century with the decendants of Loclann, lord of Corcomroe, Clare. Originally this family formed one clan with the O Connors of Clare and ruled over a district coextensive with the diocese of Kilfenora. Afterwards, dividing their territory with the O Connors, they retained the west part known as Burren. This they held down to the 16th century. The motto of the family is: "The anchor of salvation." SOURCE: Irish Family Names. The last paragraph may make it look as if I know more than I do, so I rush to assure you, when it comes to the origin of Margaret O'LAUGHLIN, I haven't a clue!